New Orleans For the fourth year there was a tactical “strike” at McDonald’s stores. Organizers claimed there were actions of one sort or another in 300 cities around the country. 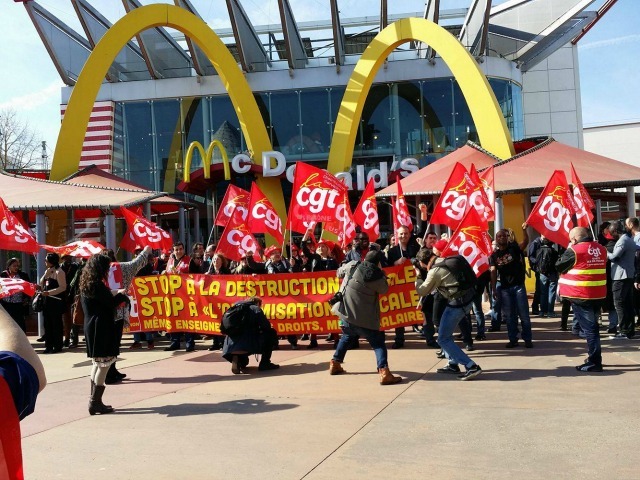 Much of the action was wrapped up in the slogan, Fight for $15, pointing out the inability of workers to live on McDonald’s wages. In the United States, caring about this issue, it was hard to find the heartbeat nationally. Not a word was printed in The New York Times or Wall Street Journal on the mid-April actions. A French researcher working as a post-doc with the Kennedy Center in Berlin on a 2-yearlong study of the Fight for $15 movement met with me while in New Orleans, and was mystified that he could not find any notice of the action so that he could attend. There were no notices on the coffeehouse bulletin board. It took a couple of emails and calls, to locate any call to action. The local papers were silent for days about anything happening. When something finally appeared in the Sunday paper, days later, it was one of those “for the fourth year” protestors chanted in a local McDonald’s and tried to get workers to leave the counter to strike without success. Talking to organizers of ACORN’s affiliate in France, there were vivid reports of huge actions in Grenoble, Rennes, and Paris. In each location stores and streets were blocked and the business was shut down for hours. The protests engaged students, unionists, and community organizations and were dramatic and militant. There was no pretense of workers’ striking, but straightforward protests aimed at McDonald’s wages and working conditions. The tactical dilemma is common: repetition blunts the impact, no matter how initially successful. In France, there was a newness. In the US, the action has become stale. That is not to say that it was irrelevant and unnecessary. Something has to be done. We have to maintain the pressure and the campaign. The challenge now is how to both keep the flame alive and exerting heat under McDonald’s, and with the actions seeming more rote and attracting less attention, there is a feeling of being stuck in a rut. Believing that workers in any real numbers will leave work to join protests at random stores might project strength, if it shut the store down, but in ones and twos and nones, it projects weakness more than strength. It underlines the fear and desperation of the workers, but to the public and in the mouths of company spokespeople it translates as lack of support. The campaign has been wildly successful in lifting up the need to raise the wages of workers. Even Walmart has had to spend billions to bump up the pay scales. Now the organizing problem is how we can couple the pressure for more pay with the understanding that it requires workplace organization as the engine that delivers that result. We need solid tactics and strategies to build that bridge, but in any case we may need something new next year to keep the drive alive. This entry was posted in ACORN, ACORN International, Citizen Wealth, Financial Justice and tagged Fight for $15, France, McDonalds by Wade. Bookmark the permalink.